Edited for wording and clarity. if His followers looked more Redeemed." Most of the time, my dealings with atheists are filled with their wild-eyed rants, insults, putting words in the mouths of others, outright slander, profanity, aloofness and other things in their efforts to dodge the truth. (After all, I can prove something until I'm blue in the nose, but that doesn't mean they will be persuaded.) No, we can offer things, but when it comes to actually accepting and believing, "Ya gotta wanna". Otherwise, they pretend to elevate reason and logic, but fail miserably. Here's a hint: put on your big boy pants and deal with the subject instead of railing, mmmmkay? One dodge that they use is to attack Christians. The problem is, some of these attacks are accurate observations. "You Christians invent God in your minds to soothe your fears!" You know, some of that is true. Especially when we don't bother to actually read our Bibles or attend a church that gives decent teaching. 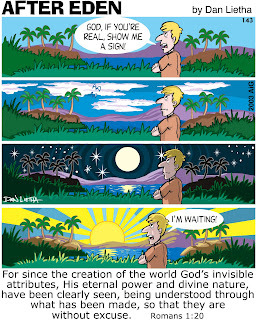 Then we tend to paint a picture of God in our minds for what we think (or usually want) him to be. Not good. We have to accept the real God, not the one in our imaginations. "There is so much fighting". I can't argue with that! A while back, I was looking for something online and saw some vicious, venomous attacks on other Christians over a doctrinal issue: "He's a popular TV preacher causing millions to go to Hell!" Wow! Strong charges there, Eustace! 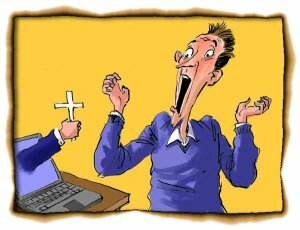 No way the preacher in question will please that author, the preacher will have to convert to the other guy's way of thinking, or simply be silenced. (There are more examples, but no need for them, you get my point.) While truth does need to be defended, many Christians forget to practice the love of Christ in their zeal. "Christians are hypocrites, and they don't act the way Christians should act". This one, I want to slap you for. First, the arrogant part. Second, for being right and I don't like it. The arrogant part is when someone who disbelieves thinks they know how we should act. So many have an idea that Christians should walk around with hands in a prayer position, head bowed, goofy smile, always soft spoken and sickeningly gentle, and if you squint just right, you can see a halo. Wrong! We're people. Then the second part, about being hypocrites. I know many hypocrites, and many of them are not Christians. As singer Steve Taylor rapped, "Can't understand us Christians, so you type us all in stereo: 'They're hypocrites, they're such a bore!' Well, come on in, there's room for one more." Hypocrisy is not a unique fault of believers! I agree that there is hypocrisy among believers. The problem is, we are all "works in progress", and nobody has a right to expect us to be perfect — or to fit into an unbeliever's unrealistic expectation. The hypocrisy aggravates me, and many other are well aware of it. Chuck Swindoll ("Insight for Living") gave some great messages on the subject (like this one). The worst Christian hypocrites for me are the kind that use "God talk", carry their Bibles and essentially make a big show of it all. I've found that many of the showiest ones are not genuine, and they give real believers a black eye. When unbelievers (and disbelievers) see these things, I get ashamed. The final truth there is to look at the actual head of the church (Jesus) as explained in the Bible. He is the faultless one, and the actions of his followers should not distract anyone from the ultimate truth. I know that it's a tough challenge, but give it a try. And remember, true followers of Christ, acting in love, have done a great deal of good in the world. By the way. That quote at the top from ol' Freddie Nietzsche? 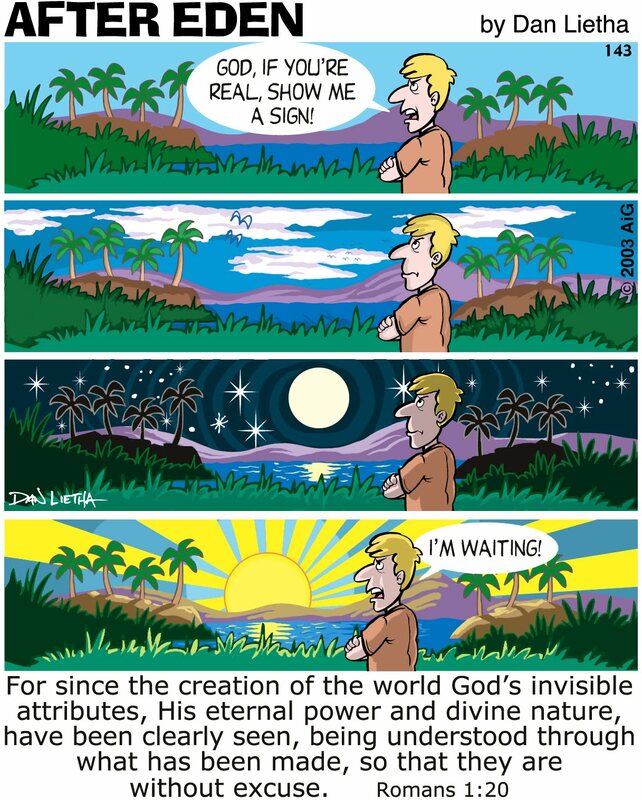 Don't forget how the author of the "God is dead" philosophy ended up. He died, completely out of his mind, in a madhouse. Rom. 1.19-20 , and see Paul's attitude in Eph. 3.8 . If there are any intellectually honest atheists reading this and you're not afraid of answers to your questions, I have some suggestions here. If you're sincere, you can also write to me. The address is in the profile. I want to leave these things alone, but I keep getting involved — and having a perverse joy with it. Why aren't the few thoughtful atheists and agnostics embarrassed by the actions of the vast majority of arrogant atheists? I have to talk to and about that bigger group, and the more civil "live and let live" atheists think I'm going after them as well. But the majority of the time, the atheists are rude weasels begging for a good slapping down. If you're a "good" atheist, then duck! Funny how there are atheists on Twitter, Facebook, forums, "boards" and such that put "atheist" in their names. It puzzles me that someone would want to have their entire online identity (or possibly every aspect of their personhood as well) wrapped up in something so hostile, negative and antagonistic. But anyway, it helps me identify my opponents. (One actually goes by the name "gaytheist". Wow. Provoke much, Bubbles?) If you read their postings, you can see that their entire purpose in life seems to be to cause problems. Nice to have a purpose in life, innit? So anyway. In 1934, the Veterans of Foreign Wars placed a huge cross in the Mojave Desert as a memorial to those who lost their lives in the First World War. Eventually, the slimeballs at the ACLU screamed, "That violates the separation of church and state!" A federal court ordered it covered up in 2002. The US Supreme Court refused to order that the cross should be torn down. Instead, they did the cowardly thing and referred it back down to a lower court for more review. That means, it's still in a box. Or was. Roger Hedgecock posted a link in Twitter to an article about thieves stealing the cross, and asked why anyone would do that? I reposted his link and added that they're full of hate. An antagonistic, arrogant atheist replied back to me that they're afraid of a state-sponsored religion. (I gave him the Twitter version of a "drive-by": A snotty remark followed by blocking him.) What, are you nuts? Things are going your way in this country. Besides that, do you have so little faith in the Constitution? After all, people can believe or disbelieve however they want, no federally established religion is allowed, for over two hundred years! More than that, Pinhead, you're essentially saying that "the end justifies the means" as an excuse for crime. And you people dare to refer to Christians as Nazis? By the way, call an ambulance before you go reading the constitutions of individual states. All that God and stuff they talk about, it'll put you into shock. Oh, wait, there is reason to be afraid. After all, your kind is "progressive". And Progressivism is the greatest threat to the Constitution that exists. Essentially, it means to "progress" away from what the Constitution originally meant, and towards statism. Atheists and "Progressives" have this in common: No anchor, no standard for ethics and morals. The Constitution should change with the times, according to Progressives. Morals are up to each person according to the atheist. That leads to Chaos, according to people with sense. Hey, atheist, you have a conflict because you won't be able to choose your own morals, they will be controlled by the state. Hahahaha! The bottom line is that whoever stole that war memorial is a hateful piece of slime, and I hope they get put in jail for the longest possible prison term. Maybe we can hook them up with a couple of very lonely inmates, too. Buon giorno. First of all, I want to mention how I fouled up the other day. Whenever I make a posting, it gets announced via Twitter and also put on Facebook. Aside from the automatic thing, I will help it along and give it some extra wording to make the announcement sensible. Well, the announcements went out, and then I began tinkering with the layout here. I thought I had things cleared up, but a couple of atheists jumped on the blog posting that appeared on top of mine. They made comments on Twitter that caused me to go, "Huh?" But they were so determined to find something to cry and badger me about that they did not read my own material (most of them did not spend any time on this Weblog at all.) Only one guy did keep going and read my work, the one that asked me for a clarification on something. That just reinforces my belief that atheists do not want to deal with opposing points of view, they are more interested in throwing stones. After all, when all they read was a follow-up piece to this one, (which was an expansion of another) and none of the rest of my material on atheism, it reinforces my belief that they are intellectually dishonest. Having read some other Weblogs by Christians that were directed to atheists, my belief is reaffirmed. They were acting like monkeys flinging poo, insulting the integrity of the authors as well as using profanity in their personal attacks. So it seems that I have gotten away easily in my own Weblog (but not in other places). I will be "getting mine", because I will not stop posting the truth. 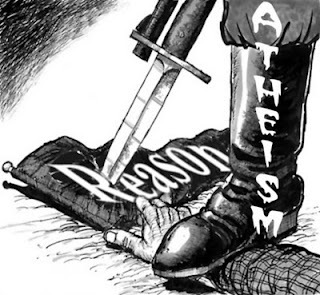 I am recommending for those atheists that want to fight, if they don't know about them already, try Atheist Central and also Debunking Atheists. Since my Weblog is multi-purpose, I can't give you shiny things to play with every day. And since I'm a "cut through the crap" kind of guy, I don't have time to play "gotcha" philosophical games for very long. Some of the changes that I wanted to talk about are that I am going to have to be more willing to repeat myself. I recently learned that this is a Weblog, not a book. What I mean by that is people are coming and going, not reading from beginning to end; Weblogs are dynamic things. Also, it's almost three years old and I can't expect anyone to remember what I said on a topic before. All of this is because I'm reluctant to give someone an opening to say, "You said that before!" Well, I'm going to have to do it, anyway. I have been going through some changes myself. Some of it I have to thank the atheists for! I have not darkened the doorway of a church for about fifteen years (another thing that will be changing), but I couldn't let them get away with bashing the truth while I was in certain forums or making comments on some Weblogs. That caused me to reach back into what I know and what I believe so that I can put up some kind of defense. Not that God needs my "help", but I had to do it. Anyway, over the past few years, and then accelerating in recent months, I have been coming back to my faith in God through Jesus Christ. No, this won't turn into a preaching forum. But my beliefs will be a little less subtle. Who knows, perhaps I will have a spiritual application come out of an article on flash drives. Unlikely, but possible. I'll get back to the political stuff eventually, but I have lost ground to make up, and I'm listening to Bible teachings and such. There is a great deal to re-learn, and God has a great deal to straighten out in me. Yesterday, I installed a gadget that will let people see a Bible verse when I make a reference to it. All you nice people need do is hover over it. Try it, just bring your mouse pointer to Genesis 1.1, and you'll see what the verse says. You don't even need to click on it unless you want to read more of that passage. It saves me the trouble of putting the actual text in myself, and saves you the trouble of being distracted if you don't feel the need to read my reference.